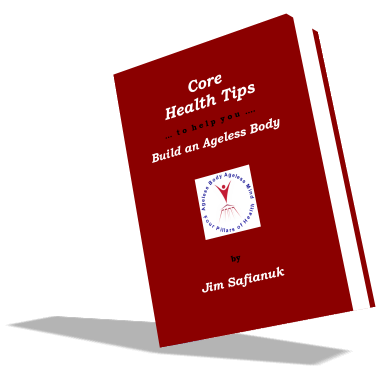 The second e-book in our two-part series is entitled Core Health Tips. Here, once and for all, you learn the truth about health in terms of beauty, fitness, nutrition, and wellness. In the mainstream, half-truths and misinformation prevail when it comes to these all-important aspects of life. Now, you will find all of the inside information that is missing and that you need to build a new, healthy you at the cellular level. Core Health Tips is for everyone who wants to pull themselves back from the threshold of disease and return to a baseline of health. With the guidance contained in the e-book you will then be able to move deeper into the health zone and build an ageless body at the cellular level over time. In addition, many mainstream myths and misconceptions are debunked along the way. There are also a number of protocols, procedures, and resources included, where appropriate. This is the first edition of Core Health Tips. The publication is available in the easy-to-read PDF e-book format. In terms of your health, nothing is as important as your beauty, fitness, nutrition, and wellness, especially as you age. But, once and for all, you need to get it right. Here, in this handy collection of health tips we help and guide you to accomplish that very goal by covering all the bases in an easy-to-use, tips-based format. You discover the fluids you need to drink to maintain youthful skin. You find out about the fluids to avoid to prevent saggy skin. You learn about the foods to eat to maintain supple skin. You understand the foods to eliminate to prevent wrinkly skin. Biological Rhythms: This is another one of those factors that leads to a vibrant, healthy body. Hydration Level: The skin-hydration connection has been well established with regards to maintaining beautiful skin with age. And Sleep, or Lack Thereof: A lack of quality sleep is not only a hindrance to a healthy body in general, but also to your appearance. It is during sleep when the body repairs and regenerates itself at the cellular level, and this includes your skin cells. natural, whole foods way of eating. I am certain the core health tips will help you rebuild your body at the cellular level. Weave the tips slowly into your lifestyle and apply them over and over again until they become second nature. Remember, even though it is easy to regenerate your body, it does takes time. So, go slow and reap the benefits offered by the core tips. You will then be on the road to building an ageless body, and you will never want to turn back. E-book Price: The 126-page Core Health Tips is priced at $127.00 USD. How to Order: To buy the e-book, click the Add to Cart button below. Our Guarantee: Your purchase comes with a 180-day money-back guarantee. This means there is no risk and no obligation on your part. If your health, energy, and vitality do not begin to soar after implementing the core health tips into your lifestyle ... simply return the e-book within the above time period and we'll refund your complete purchase price with no questions asked. Your Account: Orthocellular Nutrition and Exercise Inc., guarantees that under no circumstances will unauthorized billings or recurring transactions be applied to your credit card account. All products purchased from Orthocellular Nutrition and Exercise Inc. via this site will always be shipped or made available for download. Orthocellular Nutrition and Exercise Inc. and PayPal.com will never debit your credit card for a higher than advertised price. Like its predecessor Essential Health Tips, this e-book is another one of those great equalizers when it comes to the truth. It addresses the important health information that is missing in today’s world, especially if one has been exposed for too long to the mainstream media where half-truths and misinformation prevail. We are certain that it will fill this knowledge gap. After weaving the core health tips into your life, you will take your health to the next level and continue to experience a new you at the cellular level. You will now be on the road to an ageless body. And this is as it should be! E-book Price: The 126-page, Core Health Tips is priced at $127.00 USD. Jim Safianuk is on a mission to get the truth out about what it takes and what one needs to do to get back on the road to leading a lifestyle that is not only healthy, but also vibrant, full of energy, and long-lived. There is just too much, self-inflicted disease out there in today's world according to Mr. Safianuk. With Core Health Tips, Jim holds back nothing when it comes to the truth. In this way, you get an e-book by an author you can trust, as well as a wealth of advice that is of the highest quality. The health information will definitely stand the test of time. You can put the core health tips to use for years to come while on the road to an ageless body. Jim realized that most men and women in North America consistently live their lives in a way that is conducive to producing disease. When you lead a lifestyle that is outside the boundaries imposed by where we stand on the evolutionary scale, you set yourself up for illness, ailments, and disease. We are still hunter-gatherers and creatures of natural food, pure water, daily movement, minimum stress, and quality sleep. A positive attitude and outlook on life also contribute in large amounts from the wellness angle. There is no getting around the above facts. To turn a wrong into a right, Jim decided to write and publish the truth in a format that seemed most applicable to our times. Hence, Core Health Tips was born. This approach provides health information in short snippets, as well as in a Question and Answer conversational style, as if a person was sitting across from Jim at a table and asking him questions. To cover all the bases in terms of the four, core categories, Jim had to draw on his science background, analytical abilities, talents as a professional writer, both article and technical, as well as his current training in holistic nutrition, indoor exercise routines, and outdoor physical activities.